With more than thousand shops around the country Grameenphone Express brings you Digital services and Smartphones at your doorstep. 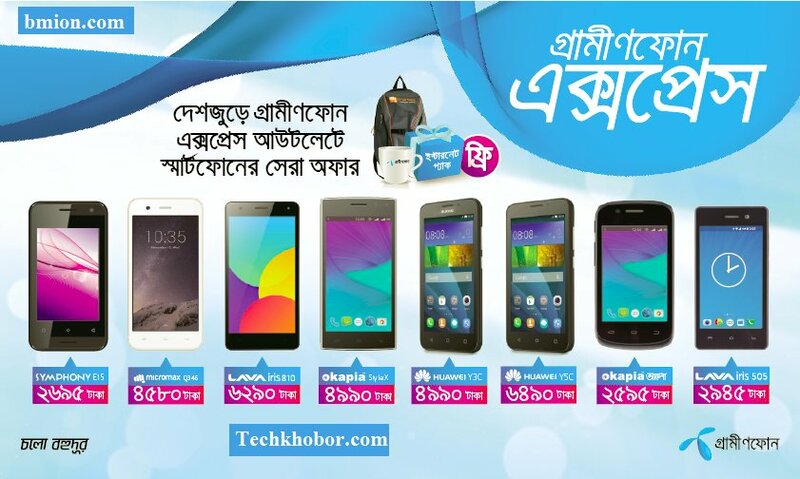 Get the best smartphone deals in Grameenphone Expresses. Visit your nearest ones to get free gifts, voice offers, internet packs, Facebook data with smartphones. Buying the smartphones from Grameenphone express customers will get mug free with selected models (Symphony E15,Huawei Y3C, Huawei Y5C, Okapia Style X, LAVA iris 810) and Bag free with Micromax Q346. Customers will be tagged automatically after inserting GP SIM in the devices. All other tariffs/pulse/features will remain unchanged. In case customers are not automatically tagged, then customers can write “IPTAG” and send to 5050 for tagging. All Grameenphone Prepaid Subscribers who will purchase any of the mentioned Smartphones will be eligible to get the customer offer. Customers can check how many times they have availed the offer they need to send SMS “Check GPPHONE” (not case sensitive) to 5050. One IMIE can be tagged with one MSISDN number. So multiple MSISDNs cannot be used in same IMEI for getting this offer. All other tariffs, pulse etc. remains as is as per product and features. For multiple tagging by same user, first valid tagging will be considered and campaign benefit will be disbursed.